Beginning in 2010, Wakefield began conducting Home Visits to families of incoming ninth graders! Our purpose is to begin to develop trusting relationships between families and teachers. 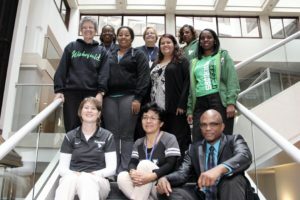 Almost one hundred members of the Wakefield staff (teachers, counselors, administrators and instructional assistants) have been trained as visitors. The highlight of their visit is listening to the family’s hopes and dreams for their child. Research shows that parental engagement is a critical factor in the educational success of students, but not all families feel comfortable participating in traditional parent activities such as monitoring homework, attending PTA meetings or fund-raising. Home visits are a tool to bridge gaps between school and home, especially in a region with great cultural diversity. It is also rewarding for teachers who experience family dynamics first hand and gain insight which can be used to differentiate instruction in the classroom. Visits are voluntary for families and staff alike. For more information, please contact members of the Home Visit Committee including Becky Kigin (Rebecca.kigin@apsva.us).